Some of the topics we’re exploring in the 20th Century History exhibition relate to major local and international events, some are aligned with social or technological changes, and some revolve around personalities. One of New Zealand’s most memorable personalities was Prime Minister Robert Muldoon. Muldoon dominated public life in the 1970s and early 1980s in a way that few politicians before or since have managed. When we spoke with members of the public about the exhibition early in 2007, Muldoon was the politican who seemed to have left the most vivid impression, even among those who were very young at the time. One of the factors contributing to Muldoon’s cultural survival is probably his ubiquity in the media. Not only was he one of the first politicians to make effective use of television (you can view the National Party’s notorious 1975 ‘Dancing Cossacks’ TV ad on nzhistory.net), but his distinctive features were eminently caricaturable. Every political cartoonist had their own Muldoon, and he was also impersonated on television (most memorably by David McPhail on the satirical shows A Week of It and McPhail and Gadsby). We’ve found this great toby jug bearing the unforgettable Muldoon countenance! 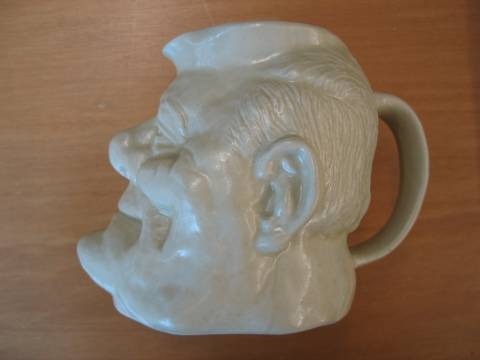 There seems some doubt about the origin of the Toby Jug of Muldoon shown in your photograph. I made it. Glad you liked it. I am a Nelson potter. I sculpted him with the help of cartoons and photographs that appeared in the listener magazine. I am both an AA Milne lover and a little daffy. Since my friends gave me the nickname ‘Wol’, as a similarly poor speller and since I had an affection for my namesake’s character in Winnie The Pooh, I impressed my ‘Wol’ mark under the handle of each one I made.